I learned more about corn from this book than I ever thought I would. It was an interesting book about the “ecology of eating” … Though be forewarned … This book has a high likelihood of causing one to lose their appetite. This entry was posted in Books/Movies/Shows on February 4, 2007 by auren. Earlier this year, I met a person named Courtney Smith and we got to talking about psychology. 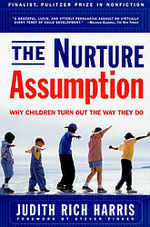 A few days later, she sent me the Nurture Assumption in the mail exclaiming that I must read it. And six months later, I finally picked it up. And wow. This is a really powerful book. It is one of the top 10 books I have read in the last five years. Yes, it was that good. Thank you Courtney. Essentially, Harris theorizes that peers are a much greater influence on someone’s personality than their parents. And she backs it up with impressive data and goes through many socialization studies from the last 50 years. If you are fascinated with people, this is a must read book. I will expand on the book in a future blog post as my mind is still rolling from it. This (very long) book does into detail about the tragedies of the 1918-1919 influenza outbreak (often known as the Spanish Flu).